I was in a cleanup mode earlier in the week. My small home office was overloaded with books. Time to do a clear out of many old and no-longer used books. Some were completely worthless. Some were relatively new; while read, not something I wanted to keep. Some were technical books which, while still valid, covered things I no longer have interest in. The last time I did this I tried to give them to a local book charity–but they had no interest. This time, after reading an article in the New York Times I was reminded of Amazon’s Marketplace. I’m a loyal Amazon customer, so I thought I would give it a shot. I put 161 books into Amazon Marketplace. The first sold within an hour of being list. Over the last two days I’ve sold 11 books. I set the price. Amazon takes a cut of the sale price. Amazon also does a computation of what they think the shipping charge should be and they bill the buyer, and credit that amount to my account. For the 11 books sold so far, the cost I charged was £60, and Amazon has taken about £22 in fees. They’ve given me an additional £32 for their estimate of shipping costs. I’ve paid £38 in postage plus a couple of more pounds for a few padded envelopes. I’ve re-used envelopes for the rest. Gives me a net income of about £32. I’ll take that for 11 not-needed-by-me-but-wanted-by-someone-else books. This is “really neat”. Pointed to by “World Changing”. This lovely video gives a different picture from the route maps. It’s a simulation of global air traffic from the fine folks at the Zurich University of Applied Sciences. The map uses data from Flightstats.com, and overlays their position on a Miller cylindrical projection. This is a monumental and unprecedented environmental catastrophe. The TVA (Tennessee Valley Authority) coal ash disaster is now estimated at 5.3 million cubic yards of waste. Coal ash contains heavy metals like mercury, arsenic, and lead. An article in Scientific American magazine dated Dec 13, 2007 states that coal ash is more radioactive than nuclear waste. Russia’s state natural gas monopoly OAO Gazprom warned Saturday that a pricing dispute with Ukraine could disrupt gas supplies to Europe. Ukraine could use its pipeline to divert Russian natural gas intended for European customers even if it fails to pay its multibillion debt to Gazprom by Jan. 1, said company spokesman Sergei Kupriyanov. If that happened, the company was “not sure we could fulfill our transit obligation” of Europe-bound gas supplies, he said. The UK is dependant on gas from Russia as supplies from the North Sea are insufficient to meet demand. The UK has insufficient facilities for the storage of gas. Further, the UK is reluctant to invest in additional gas storage facilities. This was discussed at length at a meeting of The Scottish Oil Club in November 2005 by Adrian Fernardo of Star Energy who at that time was seeking to build additional gas storage. His presentation is published here. We need to start building additional storage facilities and we need to reduce our reliance on gas from Russia. Forty years ago today I returned home from Christmas Eve services with my family and was thrilled to view the Apollo 8 astronaut’s broadcast from the moon. Unforgettable. And now watchable again and again due to today’s technology. Authors Note: This short article was originally written in c. 1999. It was written to explain what up until then had been intuitive but inexplicable. A longer article was written at the time; alas, it has been lost. Sometime this article will be updated. Meantime, it’s being published here in the Blog with the hope that it might get more notice than at www.rmschneider.com/writing. Knowledge Management is not new. Knowledge management goes back as far as human memory, and then evolved into stone tables, books, and file cabinets. Then–suddenly–in the late 20th Century “sticky notes” arrived. One of the great myths of Knowledge Management that is a technology solution. It’s not. Knowledge Management is a process that can be used to share and transfer knowledge between traditional “silos” of service management. It is a management process that transforms “noisy” thoughts and ideas into learnings and then into knowledge. What kind of knowledge do you need? How do you develop, manage, and store it? 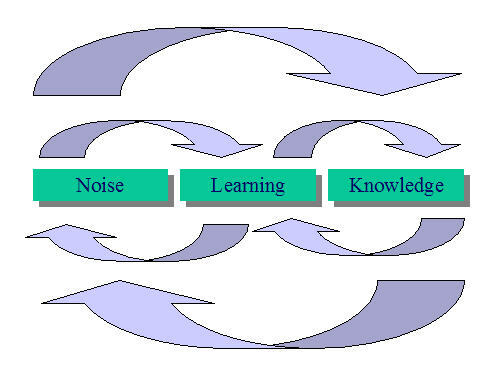 I have developed a simplistic model which I call “Noise to Knowledge”. It describes what I have observed to be natural processes for how information moves between three identifiable nodes: (1) Noise, (2) Learning, and (3) Knowledge. Information inside each node is “stored” in particular types of “buckets”. The most effective organisations have natural processes and tools which move the information through filters and tools to drive information from “noise” to “knowledge”. Where the tools or processes are ineffective or do not exist, the organistion is at risk of being or becoming ineffective. Noise: Discussions which may or may not be relevant or correct. In email, newsgroups (NG), conversations around water cooler or pub. Nuggets of information which may or may not “live”. Learnings: “the last posting” in a NG thread which confirms and finalizes the conclusion and/or learning. The “wrap-up” in a meeting. Stored in emails, “last posting”, FAQ’s, memos, etc. “One-time” then (maybe) file type of documents. Knowledge: compendium of learnings (including what’s remaining to be learned). In articles, published papers, books, maintained web pages, encyclopedias, etc. “Documents” that get written, checked, edited, published, maintained. Information flows between notes due to Processes, deliberate or “natural”, that push and pull the information through “filters”. These “filters” are people, process, and tools. It is essential that the right “tools” and storage media for information in each stage of his movement through the process are fit for purpose. Before computers, the world had this all figured out. Knowledge was in things like encyclopedias, books, standards, etc. Noise was what happened around the water cooler or in pubs. Learnings were stored in letter, newspapers, magazine articles, etc. The “half-life” of information in each media was influenced by that media and in general was inline with the value of that information. For example, information in the Encyclopedia Britannica had a different credibility that information in contemporary newspapers (which only are the “first draft” of history. Once we got computers into the mix, all things changed. No longer was it clear where that information was “best” kept; and in the absence of having proper tools that were fit for purpose, information was inappropriately stored and published. For example, or many the only place they have to store and publish is via email. Storing knowledge in email tools is a great place for that information to be at risk of lost and difficult to be made available to others. In general, due to their nature, participation, and the user-interface of the relevant tools, newsgroups about computing topics are pretty much no more than “noise” with some “learnings”. Many learnings get lost; hence the repetitious questions. We have “pointers” to knowledge, but there are few processes here that work to move the information from “noise to knowledge”. This appears to be not unusual for many “computing information/knowledge” communities (maybe because the information has a short “half-life” value). I’ve observed other “communities” where the nodes and processes I mention are more complete and hence more knowledge is retained and propagated. A major challenge for organisations is to ensure that the right knowledge management tools are provided for each phase of the knowledge management process. A suite of tools and technologies are required. These tools do not need to be, nor probably should be, large bespoke specialized “knowledge management” tools. The most successful tools are simple and ubiquitous —but that’s the Achilles’ Heel: if simple and ubiquitous they are likely to be mis-used either because that is all anyone knows, that is all they have, or worse—that is all they are allowed to have. Constraints on what people are allowed to have are caused by management (funding and leadership), the IT department (control and deire to reduce costs and make one size fit all), and self-inflicted (ability to change, learn, etc.). At any moment in time, the “best” tools and technologies are going to be different from what they where and what they will be. That’s a problem. Most importantly, people need to know how to “drive” these tools and turn noise into knowledge, and knowledge into better knowledge. 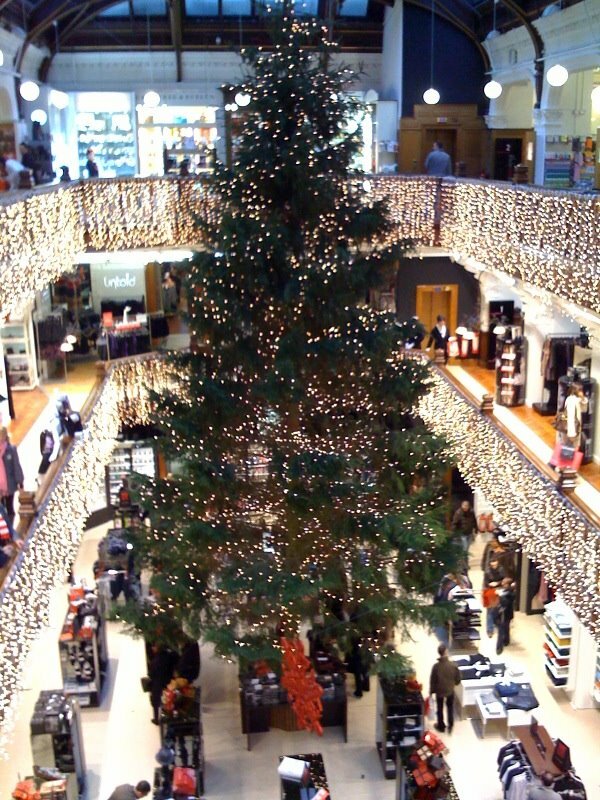 In my city, the (historically) most prominent despartment store always puts a large Christmas tree in their center all. Despite their recent sellout to a big coroporate retail chain, they continue to put up the Christmas tree. Here it is this year. You are currently browsing the Musings on Interesting Things blog archives for December, 2008.